These are three short stories with connections to Madison County. Charles T. Hughes was athletic director at Eastern for 23 years. He came to Eastern in 1929 (the year I was born) and retired in 1972 (by this time I was also on the faculty, having come to Eastern in 1959). With the advent of the new year, Little League sign-ups cannot be far behind. 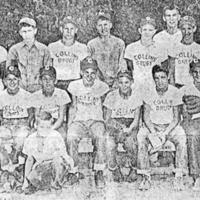 Don Richardson, local baseball coaching legend, shared with me some photos of early baseball teams from the 1950s and 1960s.